Sydämeni laulu (Song of My Heart) socks were originally designed for a sock design contest that was launched to celebrate the 100 years of independency in Finland in 2017. The stranded patterns feature Finnish nature and four seasons. Sydämeni laulu sock design reached the shared position 3-10 in the competition. 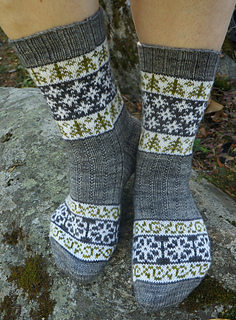 The design is the second sequel to my trilogy of traditional sock patterns, Echoes from Karelia being the first. However, Sydämeni laulu is rather a pattern that brings the traditional Finnish sock design to the 21th century than a strictly traditional design as such. Socks are knitted top down. The instructions are for 72 sts only but experienced sock knitters can quite easily adapt the pattern to 64 sts as well - it only requires some minor stitch count and creative chart C adjustments in the stranded colorwork part of the foot. The first Finnish version of the pattern was published in the March 2017 issue of the Finnish handicraft magazine Suuri Käsityölehti. The pattern published in the magazine was written by Pirkanmaan Kotityö without any co-operation with the designer. Thus the instructions in the magazine do not represent fully the original design. The original pattern written by the designer is now available free of charge on Ravelry - both in Finnish and in English. Both versions have been test knitted but feel free to give feedback if you have problems understanding the instructions or you think you’ve find mistakes.